During Art Basel 2018, Gallotti&Radice presents Luce Solida art installation by designer and decorator Pietro Russo. The site-specific installation offers a unique sensory experience intended to evoke a feeling of poetic disorientation in which visitors can explore the space to the accompaniment of sound effects composed by the designer. Approaching the installation as both a designer and a scenographer, Russo explores the relation of objects to light thus creating a dialogue between the space and the avant-garde pieces designed for Gallotti&Radice in the course of their ongoing collaboration. 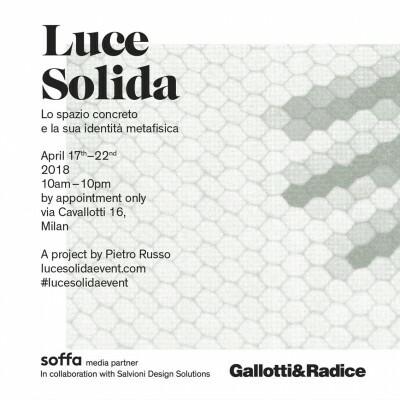 Luce Solida opens to the public from December 6 to 11, 2018 at Gallotti&Radice Miami District flagship store. Visit lucesolidaevent.com for more info.